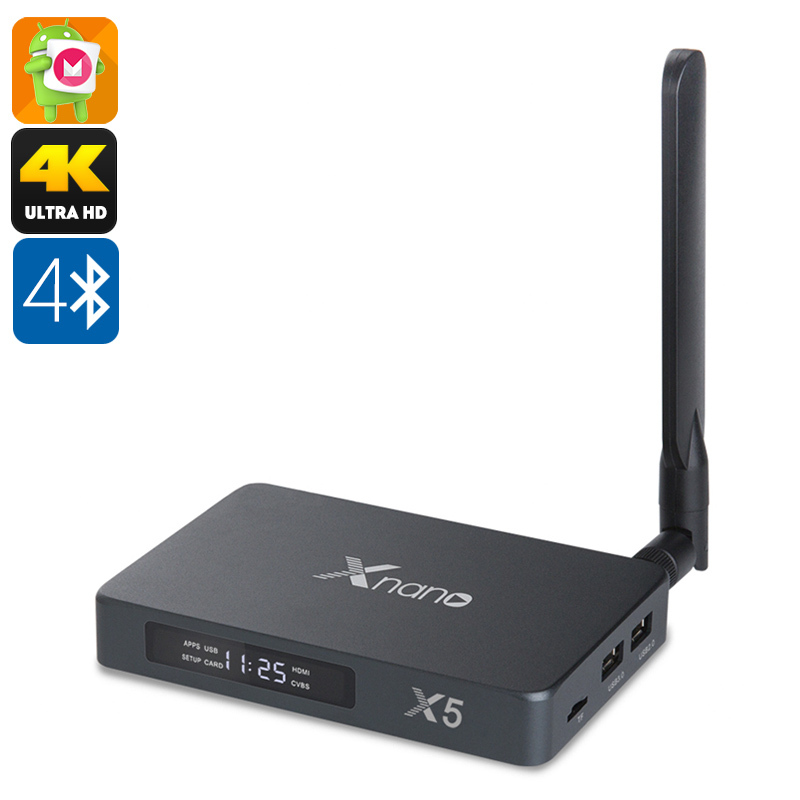 Successfully Added Xnano X5 Android TV Box - Android 6.0, Quad-Core CPU, 2GB RAM, 4K Support, Kodi TV, Google Play, WiFi, SATA Support to your Shopping Cart. The Xnano X5 Android TV box lets you play games, watch films, and browse the web from your big screen TV. Supporting 4K resolution, this Android media player lets you enjoy the latest media in absolutely stunning detail and vivid color. Thanks to this, you can watch your favorite sports matches and movies like never before. The TV box itself features a durable metal body which gives it a high-end look. Therefore, this cool electronic gadget will be a perfect asset to modern households and offices alike. If you’re looking for a way to introduce hours’ worth of fun and entertainment into your living room or workplace, this Android TV box is perfect for you. With its Android 6.0 operating system, this media player brings all the latest Android features into your home. Access to Google Play and Kodi TV let you download the latest TV Apps, games, and films. From now on, you’ll never have to experience a moment of boredom again as this 4K TV box will keep you entertained for years to come. Thanks to its WiFi support, you’ll be able to install new features at any time. Additionally, it lets you browse the web, stream movies, and stay connected with friend and family through social media. With 16GB of internal storage and a 64GB SD card slot, there will be plenty of space for you to store all your files and media. It furthermore supports DLNA and Bluetooth for efficient data sharing. Within its stylish body, this Android 6.0 TV box packs a Quad-Core processor. Clocked at 1.4GHz, this CPU brings forth an outstanding performance. Along with its 2GB of RAM, it lets you enjoy the latest software available. Whether you use this 4K TV box to stream movies, play games, or browse the web – it is sure to handle all your entertainment demands. From now on, you’ll always be able to enjoy a cinematic experience with friends and family from the comfort of your own living room.